By signing up to the Winning Poker Network via Rakeback.com you will earn 27% daily rakeback instead of the lower value VIP program – known as ‘Elite Benefits’. All that’s required is to visit a Winning Poker Network website via the links on this website rather than via Google. As a secondary backup use bonus code RAKEBACKRB when depositing on Americas Cardroom, or RBCOM when depositing on Black Chip Poker, but that’s not essential. Within that area you can pay yourself rakeback on demand. After each session, each day, or each week, the choice is yours. Get 27% of your rake paid in MTTs, SNGs or cash games back at the click of a button. As a new player on the Winning Poker Network you earn extra rakeback while clearing your 100% up to $1,000 deposit bonus as well – a net rakeback of 41.6%. How do I know if I have rakeback? 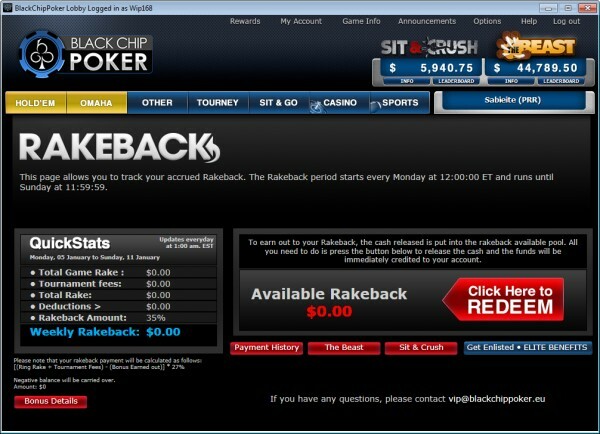 Simply check if you see the screen above under Rewards -> Rakeback in the poker client. If instead you see a table of VIP Elite Benefits, then you do not have rakeback. I have VIP benefits – I already created an account, or something went wrong. Is it too late to get rakeback? It’s not too late. Although the Winning Poker Network don’t allow us to make changes to your account, they do allow a one-time switchover from VIP to rakeback, and vice versa, if you email support. Can I clear deposit bonuses on several Winning Poker Network skins? Yes, similar to the iPoker network players can bonus whore and open accounts on several skins. The software automatically prevents players from playing at more than one room at the same time. Clear one bonus per skin at a time to earn 41.6% total rakeback per skin. Popular skins include Americas Cardroom, Black Chip Poker and Ya Poker.